W. Robert Kohorst - U.S. Ambassador in Croatia. MBA Croatia is pleased to announce Ambassador W. Robert Kohorsts lecture on “Important Factors for Creating a Successful Entrepreneurial Business”. Mr. Kohorst will give answers on what does every successful entrepreneur need to know, how Croatian entrepreneurs can be leaders and more from his experience as an entrepreneur and as an U.S. Ambassador to Croatia. W. Robert Kohorst started his career as a Law Clerk with Judge Engel at the Michigan U.S. Court of Appeals in 1978. In 1979, he went on to work as an attorney for a law office in California, where he made partner in 1982. Afterwards, Kohorst worked as an investment banker for what later became a Fortune 1000 company and stayed until he founding his own firm, Private placment Group for Public Storage, Inc., as U.S. real estate syndicator, in 1984. He worked as President in this position until 1990, when he bought two companies and became CEO and principal of Tiger Shark Golf, Inc. and Masquerade International, Inc. and also began serving as President of RK Holdings, Inc. In 1991, Kohorst co-founded KH financial Inc., which later became Everest Properties, a company that purcases and operates apartment, self-storage, and retail properties. In 2002, Kohorst began working for Maxus Realty, Inc. and stayed with the company until 2015. From 2015 until 2017, Kohorst served as Director of Posey Company. Today Kohorst is the President, CEO, Chairman and Director of multiple business whitin the Everest Group. 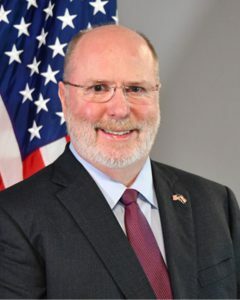 He was nominaterd as US Ambassador of Croatia in early September 2017, testified before Senate on October 5th and was confirmed by Senate voice vote on 2 November 2017. On 10 January 2018., Kohorst began his assignment in Croatia. The lecture will be held on 26th November 2018 in the premises of the Congress Centre Forum Zagreb as part of the Green Gold Centre (Radnička 50, Zagreb) starting at 18:00 o’clock, and up to date information is available on our Facebook page.